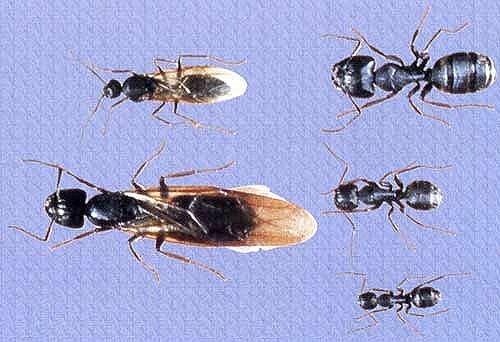 The most common ant in the Taunton MA area which causes home owners to seek professional ant control is the Carpenter Ant (Camponotus spp.) 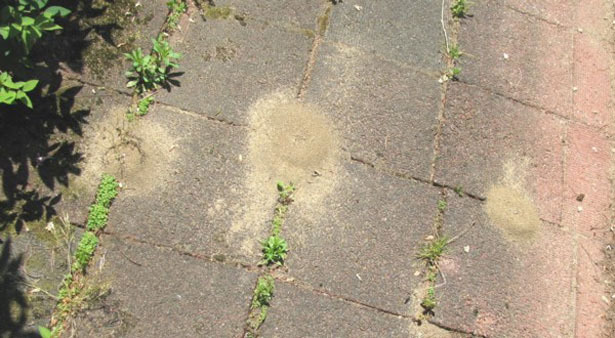 They are the most noticeable of ants in and around our Taunton MA homes. Carpenter ants are large and blackish with some faintly grayish bands on their abdomen. 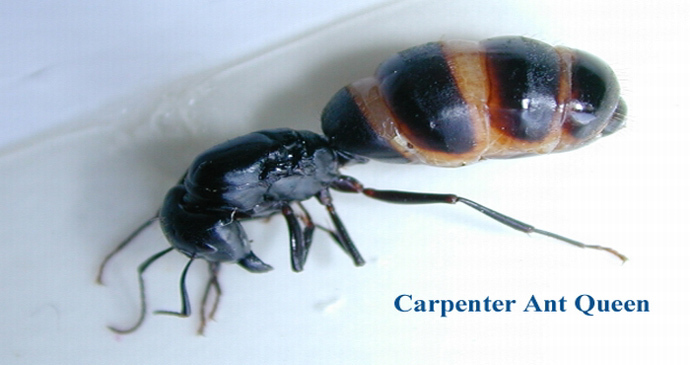 Other carpenter ants may have some reddish or purplish coloration to the thorax (middle body part). Foraging workers have large mandibles which can give a powerful bite. They vary greatly in size, depending on their function, from 1/4 to 1/2 inch (minor workers), 1/2 to 3/4 inch major workers and 3/4 to 1 inch long winged reproductives. 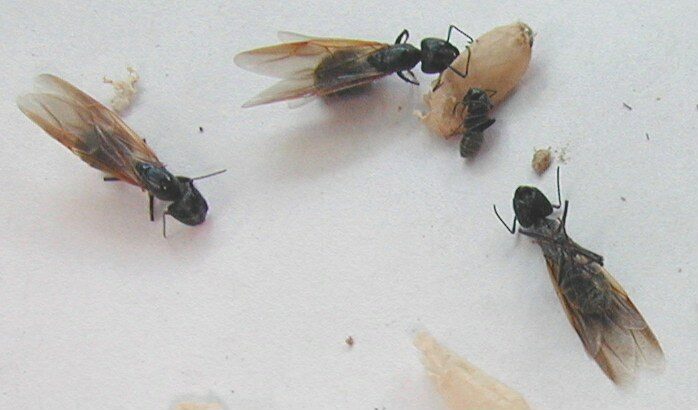 Most carpenter ants seen inside your home are the wingless minor workers that make up most of the colony. They are black medium sized ants. Carpenter ants can cause serious damage to wood by excavating galleries, which somewhat resembles the work of termites but can be distinguished by their very clean sandpapered appearance. Sawdust or wood shavings known as frass found in and around the home is usually an indication of a nest being excavated nearby, but very often it goes unnoticed because the wood shavings are being deposited inside your walls. Carpenter ants do not eat wood, but they rip it apart with their front mandibles for nesting. Moisture is a desirable condition for ant colonies, and wood which has been water damaged is a prime target for new nests, although perfectly dry and sound wood is also excavated. Galleries are cut with the wood grain and major workers then carry the developing larvae from the outside nest ( around 30,000 ants) to the new satellite colonies in nearby homes. These secondary nests can have up to 3,000 workers.